Introduction to integrating theory with practice. Competent occupational performance in the environment (COPE). Understanding occupation. A taxonomy of human occupation. Levels of occupation. Environmental levels. Competence. 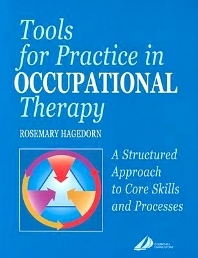 Core processes in occupational therapy. Why is engagement in occupation therapeutic? Synthesis: the art of practice. SECTION 2. THERAPEUTIC USE OF SELF. Introduction to therapeutic use of self. The therapeutic relationship. Dyadic interaction: styles and skills. Interviewing. Working with groups. Teaching. Professional education. SECTION 3. ASSESSMENT OF INDIVIDUAL POTENTIAL, ABILITY AND NEEDS. Introduction to assessment of individual potential, ability and needs. Assessment at the developmental level. Assessment at the effective level. Assessment at the organizational level. Introduction to occupational analysis and adaptation. Approaches to occupational analysis and adaptation. Microanalysis. Basic task analysis. Basic activity analysis. Macroanalysis and client-centred analysis. Demand analysis. Applied analysis. Therapeutic adaptation: approaches and techniques. Functional adaptation. Introduction to environmental analysis and adaptation. Analysis of the environment. Therapeutic adaptationand management of the environment. Analysis and adaptation of the home environment. Health and safety and accident prevention.